The cmder app is a free app you may download as a mini version of just 6MB, or as a full version with just 40MB. It is a console emulator that you may also transfer to a USB drive, which means it is highly portable. There are other free emulators for Windows, but this app was created out of frustration because of the lack of “nice” emulators for Windows. Try not to think of cmder as a single app because it is more like a software package. For example, the emulator has tabs such as command line, Macro, Console and DosBox. 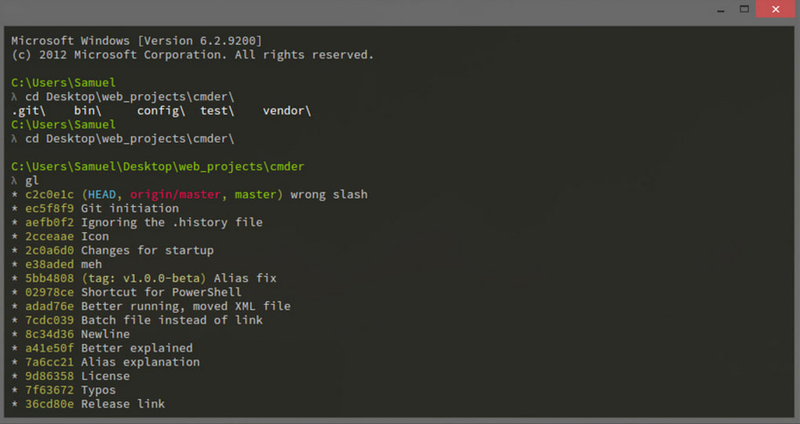 It is far easier to use this program than it is to use something such as Git Bash prompt for all your git command-line tasks. You may also play around with this program and do fancy things such as basic UNIX commands like mv, ls, cp, cat, grep and so forth. There are also things such as built-in aliases, such as the one for Windows explorer where you type “.e” and at your current location you will see an explorer window open. Cmder will probably win you over because it supports for ^C and ^V for Copy and Paste. If you go online and do a little searching, you will find all the other basic commands you can use with the program. It may not seem overly fantastic, but compared to the alternatives, it is a top performer. What do you think about cmder? Do you recommend it? Why?